Tanjabaker on Abolish The Death Penalty Now! susie fought on Fundraiser For my Fave Non-Profit!!! Susan Croft on Fox in the henhouse and in the jailhouse. Molly on Fox in the henhouse and in the jailhouse. Click on this link to go to my photo site. Find out why some call me one of the causes of societal degradation. Oh well, what can you do? 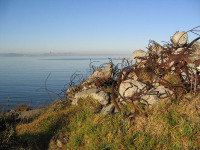 These photographs are just a few I have taken over the last ten years at The Albany Bulb, also known as the Landfill, the Waterfront and just The Bulb. It is a place I feel passionate about. That much is obvious. 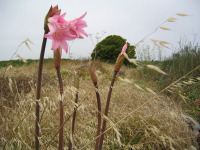 There are many of us who believe that this piece of the much hyped Eastshore State Park should have been left untouched and unmanaged - because it is a unique example of what happens when a place naturally and organically self regulates. But the dogma of 'preservation' and 'conservation areas' 'resource protection', 'habitats' and 'liability' overrules all individual identity. They cannot leave anything untouched, un-designed. It is as if if they (the park planners) didn't make it, it has no value. Rules, guidelines, regulations, interpretive signage, fences, safety, sanctioned art - it leaves nothing to the imagination. That is what the landfill meant to us - a place of unlimited imagination. Deb from Minnesota, who reads my blog (thank you Deb!) and often comments, noted that my description of what is happening at the Albany section of the much hyped Eastshore State Park seems so at odds with the official version. Now there's a shock. It's almost impossible to describe what the old Albany Landfill (aka The Bulb) feels like, unless you have been there - but when you have, and especially when you have allowed yourself to go there with one of the many self appointed 'tour-guides', the question you will ask is 'Why don't they just leave it alone?". 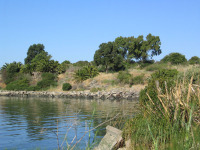 It's absolutely true that were it not for the preservationists of the 60,s, 70's and 80's - early visionaries in this area who wanted to slow or stop the rampant commercial and business park development along the Bay shoreline - this expanse of former landfill would already be lost as open space. I'm not arguing that. The filling and polluting of the Bay is one of the terrible consequences of the rush to build postwar suburbia. And the same profiteering now fuels the development of tract housing and gated communities on what used to be farmland and open space less than a generation ago, so that even a simple task like shopping for bread and milk requires you drive your massive SUV to a store in a developed mall a few miles away. But the good intentions of those activists have become the proscriptive doctrines of those who build and run parks. The big lie is that the park system will give greater access to more of the 'stakeholders'. These days, a Bay Area politician without a 'endorsed by the Sierra Club' stamp on their election door hanger means virtual banishment from the corridors of power. But the reality is that doctrinaire environmentalists have the politicians by the throat and support in the next election depends upon their buying into the creation of so called 'natural habitats' and 'resource protection areas' where humans are shut out and made into observers of nature instead of participants. 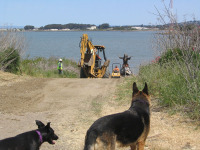 This is the backdrop to what has happened with the Eastshore State Park. But it is at the Albany piece that an almost epic battle has been waged. And while I could try (and probably fail) to describe the evolution of the battle and as importantly the battleground, I'm just going to say that the place has become a jewel - simply by being ignored by the authorities. For years, it was allowed essentially to self regulate, plants grew without being tended, animals and birds arrived, reptiles and rodents emerged, rose bushes bloomed hidden between concrete slabs dumped 40 years ago, artists came and left a treasure trove of outsider art, the homeless moved in for over 10 years. It was a dump for chrissakes. Everything that grew and breathed there came because it could, because it bubbled organically into a cauldron of life and eruptions of leaves and berries and trees. 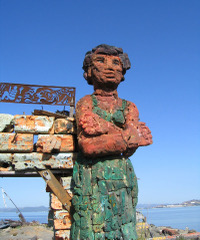 The remnants of the dumped concrete and rebar plunges from the earth in sculpture of its' own making. As my friend Osha Neumann (one of the artists and one of the few civil rights attorneys to represent the homeless when they tried to resist eviction) says, "It is a place of wild imagination". And now, they have started the process of destroying that imagination, to replace it with something that can be controlled, contained and coerced into compliance with a 'park plan'. It is breaking my heart. As much as any love affair gone wrong. And in a few years all that will left of this imagination will be a few 'interpretive' signs. I will not soon get over this heartache. I once said to a good friend that when the Landfill is taken by the forces of conformity, I would leave this area. Native plants (what exactly is native to a landfill) are meant to replace the palms, the roses, the vines, the fruit trees and the lone eucalypt on the Bulb, the art has long been deemed 'unsuitable for a family park' and the dogs - like the art - will be leashed, forever. I can't even imagine what the loss of that place will do to the community. Some of my favorite photos of yours are from the landfill. Your last photo broke my heart as I am sure it does yours. Jill, thanks for your description of what has happened with the landfill. That really helped me see your point about homogonizing the landfill environment. Hey, I'm coming to San Francisco the last week in August for a conference. And Deb, there won't be much left of my urban wildness at Albany, but I'd be happy to show you what remains, if you'd like a tour.